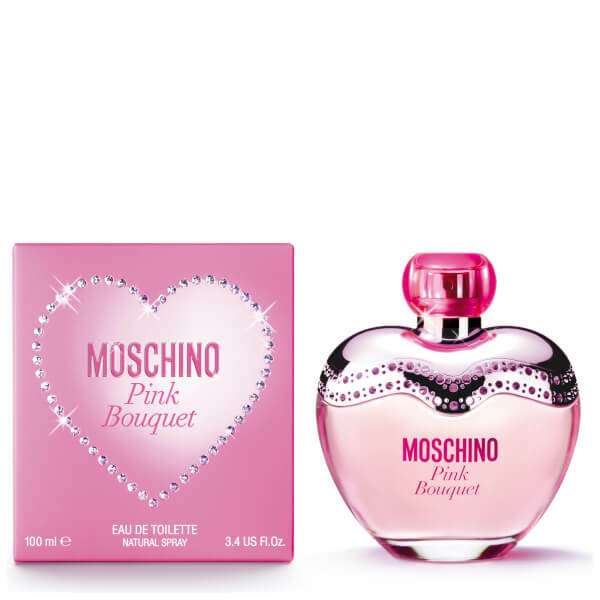 Moschino present the Pink Bouquet Eau de Toilette; a bright, energetic fragrance that blends floral and fruity accords. Opening with fresh Bergamot, juicy Pineapple and delicious Raspberry, the playful EDT is enhanced by Peony, Jasmine and Lily of the Valley, before succumbing to a soft trail of Peach, Musk and Gingerbread. Housed in a heart-shaped pink bottle and matching gift box. Top Notes: Bergamot, Pineapple, Raspberry. Heart Notes: Peony, Lily of the Valley, Jasmine. Base Notes: Gingerbread, Musk, Peach.